By far the only chips released under Intel’s 8th gen branding are the Kaby Lake Refresh ULV processors. As the name suggests, they are based on the same architecture, however, a bit tweaked. Both the Core i5-8250U and i7-8550U that we are going to compare today have proven themselves quite powerful. We have seen that they are blowing away their 7th gen counterparts and they even rival the Kaby Lake HQ models. It’s only fair to compare the Core i5-8250U and i7-8550U side by side to see what are the differences. Is the Core i5 powerful enough? Is the Core i7 dedicated to professional users? Which one will be more commercially successful? No surprise, both chips share most of the specs. The main difference is in clock speeds and cache capacity. As we said they are based on the Kaby Lake architecture and use the 14nm lithography. While the TDP of 15W hasn’t changed nor improved over the last generation, the number of threads have doubled on the new KBR CPUs. Now the low-powered ULV chips are equipped with four cores and Hyper-Threading (which essentially makes them eight) which enable advanced multitasking. Also, cache levels have greatly improved over the 7th gen as the Core i7-8550U has double the amount compared to the i7-7500U – 8 vs 4MB. Even the Core i5-8250U has more than last year’s i7 – 6MB. However, the big number of cores and threads comes at a cost. The new chips have a rather low base clock. The Core i5-8250U starts from 1.60GHz and the i7-8550U from 1.80GHz. Don’t worry though, Turbo speeds reach up to 3.40 and 4.00GHz respectively. The quad-core eight-thread design results in a much higher multi-threaded performance compared to 7th gen. Despite the low base clock, we see an improvement in single-threaded too mainly due to the high Boost clocks. Both the Core i5-8250U and i7-8550U are equipped with the same integrated GPU – the UHD Graphics 620 which is essentially a rebranded HD Graphics 620. However, the unit inside the Core i7-8550U has a slightly higher maximum clock – 1.15GHz vs 1.10GHz which wouldn’t make much of a difference if at all. Looking at the graphs below we see a couple of things. The first thing is the fact that the Core i7-8550U is as expected faster and better than the Core i5-8250U. The performance gap is around 20 to 30% in most benchmark tests that we have conducted. This is best seen in the Cinebench scores and it is mainly due to the higher maximum clock speeds of the Core i7-8550U. The second thing we notice, however, is not that fascinating. The actual real-life performance of the Core i7-8550U doesn’t seem to be that much greater. The chip scored just around 9% higher than its rival which translated into more easily comprehensive terms means that the Core i7-8550U managed to complete the same task as the Core i5-8250U just less than a second (0.95s) faster. To be fair a second faster is barely noticeable and even when we extrapolate, the saved time won’t be too much. Here you can see an approximate comparison between the CPUs that can be found in the Dell Inspiron 15 7570 models on the market. This way you can decide for yourself which Dell Inspiron 15 7570 model is the best bang for your buck. Overall, the Core i7-8550U is faster and better than the Core i5-8250U which is not something to be surprised of. However, the difference in performance is not too much and while benchmarks promise 20 to 30% better results, real-life tests show a sub-10% increase. With that said, we would actually recommend the Core i5-8250U because of the lower price. We are quite happy with the performance of both chips and it is astonishing how they rival last gen’s Core i5 HQ models while using a third of their power. We think that the Core i5-8250U is ideal for those users who seek a compromise between efficiency (long battery life) and performance. The Core i7-8550U is, of course, all this but better, however, we think that the sub-10% increase in performance does not justify the $112 (data is taken from Intel’s official website) price bump. The Core i7-8550U is, of course, all this but better, however, we think that the sub-10% increase in performance does not justify the $112 (data is taken from Intel’s official website) price bump. Users who really need that extra performance should consider an HQ or HK processor or wait for the Coffee Lake release. Then again, if the price is not a problem and you still want the best performance/battery life ratio, the Core i7-8550U will suit your needs. 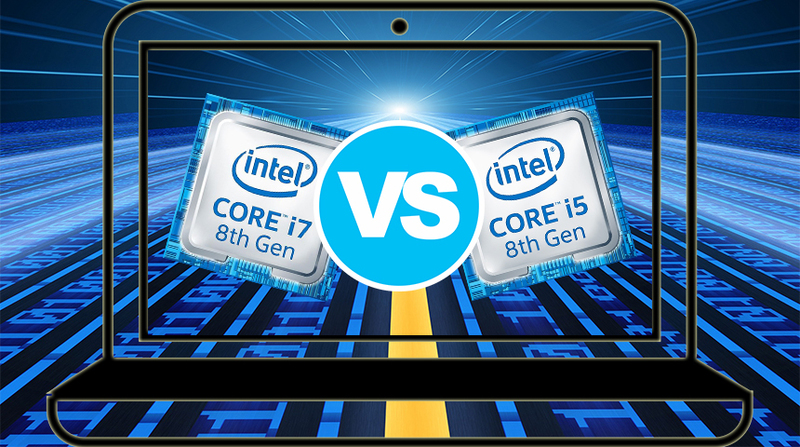 We just think that the niche for Core i7-8550U users is a lot tighter than the one for the Core i5-8250U. It would be nice to have a comparison between an i7 7700hq and an i7 8550u, I hope you will do it soon. The requested comparison is next on our list. Great job on the comparison! Thank you! It was very helpful! Googled for the real world comparison and came up with this page. If you want to save cash, get the i5 8250u and then upgrade RAM. Laptop prices are a bit off though. Any reason why 32GB ram max cannot be allowed to either 8250u or 8550u laptop if you use 16GB ram sticks? I have an 8250u, and after undervolting by 0.1V with Intel’s tuning software, my Cinebench R15 score is in the 650-680 range (highest score 682). So under heavy workloads the 8250u and 8550u throttle the same, and have the same overall performance. It’s really just a matter of keeping the cpu’s cool enough to ward off throttling as long as possible. What do you see in the way of battery life with i7 vs i5? I like the i7 speeds, but not sure I need an i7 though I would like the better battery life out of my laptop.